It’s Tuesday, not Friday, so why are spending the day with Dorie today? Well, I’ve joined in with another social cooking group. The original Tuesdays with Dorie was a precursor to French Fridays that cooked their way through Dorie Greenspan’s Baking cookbook. Now that they committed their mission, another baking adventure is underway. The goal this time is to bake through Baking with Julia, a book written by Dorie Greenspan to accompany the same-named PBS series where the amazing Julia Child baked with the upcoming American artisan bakers of the time, the mid-1990s. I’m much more of a cooker than a baker, and amazingly, I don’t have a sweet tooth, so when this group was announced, I was on the fence about joining in. However, as I followed my fellow bloggers from the Friday group when they started in February, it seemed like more and more fun. The Tuesday group makes just two recipes a month, rather than one a week, which is manageable, and I’ll hone my baking skills as we go. So I’m throwing my potholder into the ring as I participate with Tuesdays with Dorie for the first time. 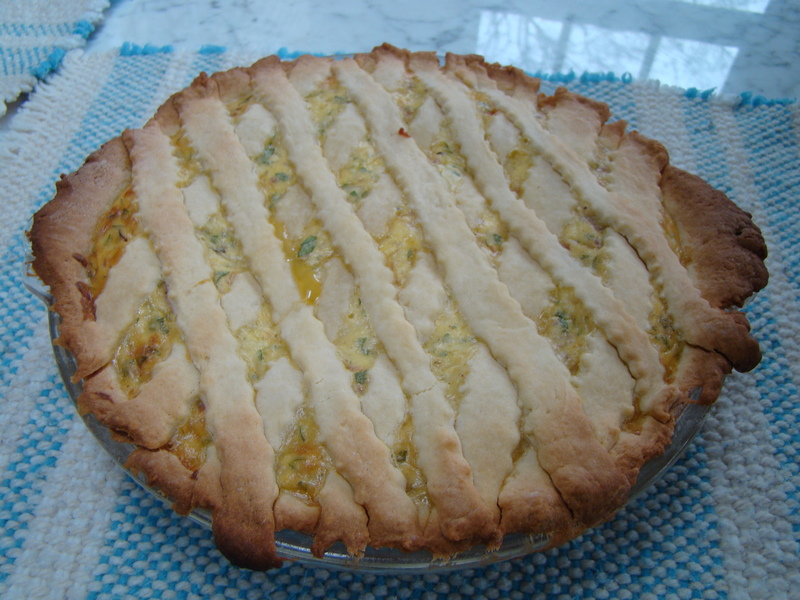 This week’s recipe is for a Pizza Rustica from Nick Malgieri. This pizza isn’t at all like the pizza that comes from your neighborhood pizzeria. It’s more of an Italianesque quiche. 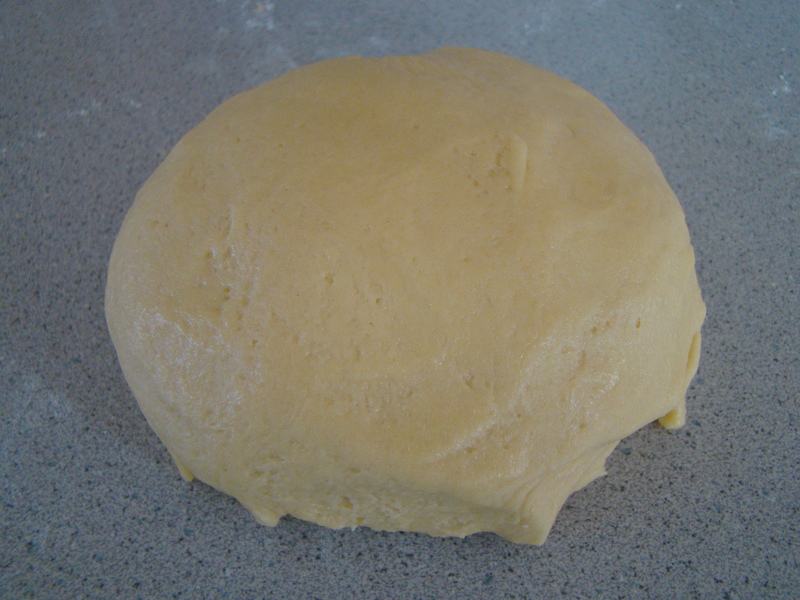 The pastry is a pasta frolla, which resembles a sweet shortbread crust. The filling is a savory blend of ricotta, mozzarella, and Romano cheeses with a hefty dose of shredded prosciutto. The tart gets an elegant touch with a simple crisscross lattice top. The crust came together easily in the food processor. I don’t know whether it was supposed to be, but it was incredibly sticky. In order to knead it, I added quite a bit of additional flour by way of the countertop. It was soft and easy to roll out, but a little fragile and not so cooperative when transferring to the pie plate. The crust was forgiving and I just pressed together the tears, The crust wasn’t baked blind, so I was a little worried it would get soggy, but it browned nicely and holds it own with the filling. I liked the savory filling. It was like a good lasagna filling. The filling would complement antipasto flavors, so I added a few spoonfuls of a sun-dried tomato and olive relish that I had in the fridge. I couldn’t really taste it, so I should have left it out or added more than I did. I never made a lattice before, and the crisscross lattice, which requires no weaving, was a good method for the first try. It was definitely less intimidating than the classic lattice. I used a fluted pastry cutter to cut the strips. I found it in one of my kitchen drawers, never used before, just waiting there for the perfect project. The biggest challenge was transferring the delicate pastry to the top of the filled pie. The look was much fancier than the effort required. Who doesn’t love that? The crust was very sweet, which was a noticeable contrast to the salty filling. I’m not sure I liked the flavor combination, sweet vs. savory, on the first bite, but it grew on me. I really enjoyed the filling and can think of lots of ways to vary it for future pizza rusticas. I might try it with a less sweet pâte brisée next time though. This makes an excellent lunch with a crispy salad on the side. The pizza travels well and made a good brown-bag option. It’s good cold, but it’s also good slightly warmed from a short spin in the microwave. You can find the recipe on the sites of this week’s hosts Emily of Capital Region Dining Blog and Raelynn at The Place They Call Home. I can’t wait to see how other bloggers made out with their Pizza Rustica. You can see for yourself, by following the links here. 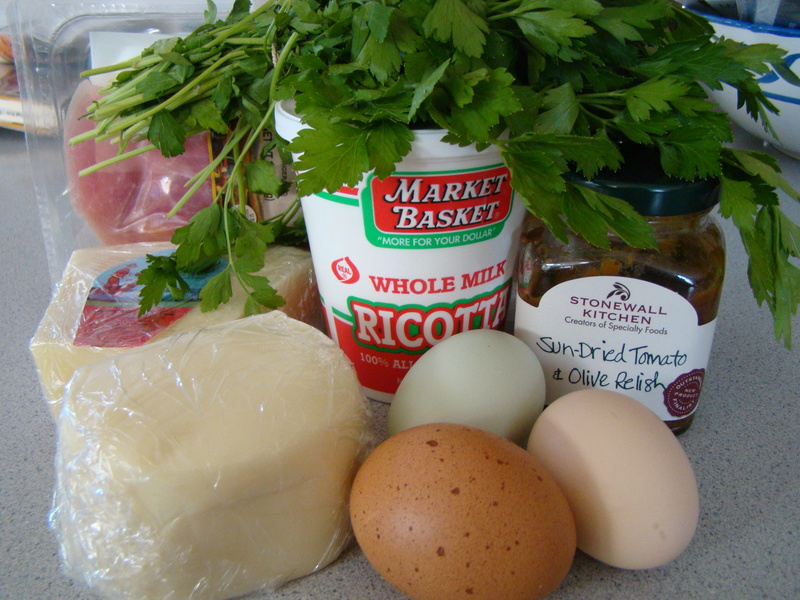 Posted on 3 April 2012, in Baking, Tuesdays with Dorie and tagged prosciutto, ricotta, Tuesdays with Dorie. Bookmark the permalink. 26 Comments. I made my lattice right on top too, but the strips were a little fragile as I moved them, one by one. The more I think about it, I think I would have had an easier time with this pastry if I’d chilled it first. Great idea to serve this rich and tasty dish with a side salad. Looks delicious! I’ve been using this group to push me out of my baking comfort zone as well. Between this & FFwD, I feel like a new adventure is only a recipe away. SO glad you’ve joined us, Betsy! I had to dust off my fluted pastry cutter, too :) Beautifully done! Welcome to the group! It looks tasty! Good thought as using it as a lasagna filling. My first lattice attempt as well. Welcome to the group. So glad you joined us, Betsy! Your pizza rustica looks delicious! Glad you’re doing TWD as well! I can’t imagine not having a sweet tooth, lucky you :-) I agree, I enjoyed the pie but next time I’d probably use a less sweet crust. Great having you on board! It looks so good! My first lattice too! I liked your ruffle edges…I couldn’t find one the couple of stores I looked. Your pie turned out great…we agreed with you on the two flavors…too sweet for the savory filling although they ate it :) Glad you decided to join the group! Your pizza looks wonderful, Betsy! I am so glad you had a chance to use that pastry cutter. :) Seriously, I am so happy that you found a copy of BWJ and threw your potholder in with the rest of us. This was a great recipe to start with. My first lattice, too, and I am glad that this was an easy one for starters. Glad you liked the pie. This was my first time with lattice and pleased that it went well for both of us. Glad you joined the baking group to challenge yourself a little! Looks like you did a terrific job. This definitely reminded me of lasagna and makes me want to make it soon! I decided to join the Tuesdays group as well and I loved the rugelach! 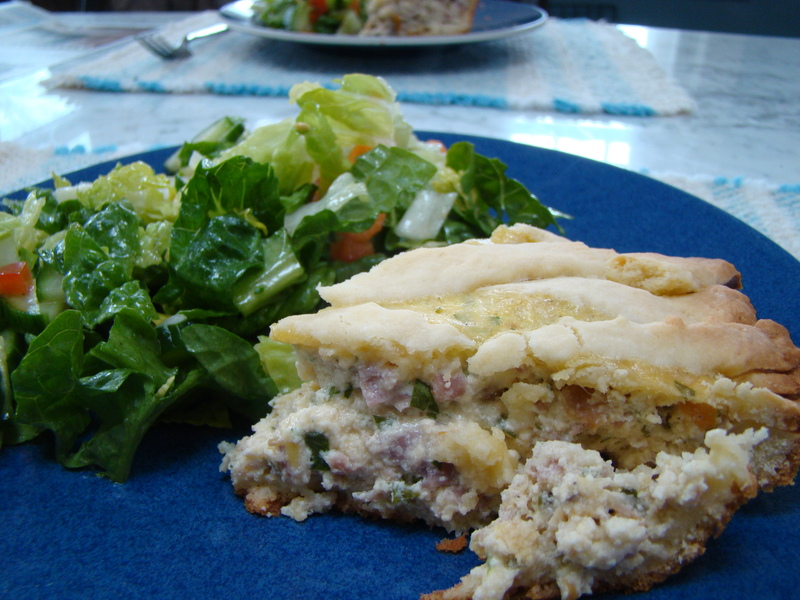 The pizza rustica would have been great with the sundried tomatoes and olive relish. I look forward to cooking with you! Welcome to the group! I love your farm-fresh eggs in the picture, so pretty. Welcome! It is so fun being in both groups, they are challenging in different ways! I really enjoyed this also, I have thought of some great ideas for the crust! Looks delicious! I love the photo of all the ingredients! Sorry, I’m a little late in going through all the Pizza Rustica entries. Glad I stumbled on yours!